If you're ready for Britney Spears to hit you one more time then you're in luck, as The Nineties TV series on CNN is currently flashing back to the past and super-sizing the pop icon along the Sunset Strip. The American pop singer made her debut in 1998 and thanks to a skimpy school uniform, pigtails and a catchy tune, a star was born and history was made. But that's not all that happened in The Nineties and this original documentary series revisits the other nostalgic cultural pop phenomenons, TV shows, music, fashion, brands, technological advances and world-changing historical events that you may remember (or not) from that decade. As a special bonus here's also a billboard for The Seventies installment sporting the beautiful Farah Fawcett spotted along the Sunset Strip on June 2, 2015. 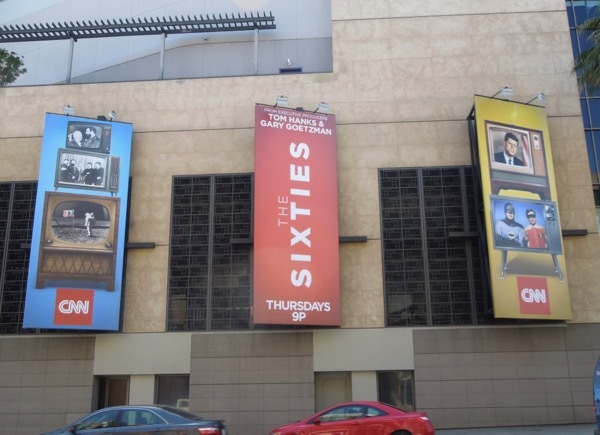 Plus this trio of billboards for The Sixties series which started it all was snapped along Highland Avenue on May 11, 2014. The impactful giant-sized billboard for The Nineties, from Britney's iconic Rolling Stone cover, was photographed on the side of West Hollywood's Andaz Hotel along the Sunset Strip on July 17, 2017. Meanwhile fans of the pop singer can also check out all these other Britney Spears billboards from recent years. What are your favourite memories from The Nineties? Were you zig-a-zig-ahing to the Spice Girls, was your heart going on with Titanic, getting 'The Rachel' haircut, keeping your Tamagotchi alive, laughing at The Simpsons, melting down with Y2K hysteria, or saying "Whatever!" or "Not!" a lot.